I have been hunting for eighteen years. I knew I was a trophy hunter beginning in 1993. I saw a 9-pointer, actually a base 8-point with a 8-10 inch spike growing out between its main beam and its right ear. He gave me an easy 15 yard broadside shot with my bow.. He was so nice that I got buck fever and shot right between his legs. He jumped back about 5 yards, watched me nock another arrow, and shoot right over his back. He bounded off. In 1994, I started my intense scouting during the first week of August because you can pretty much tell a buck's potential by then. That year I bagged a nice seven by five, 12-point that dressed out at 212 lbs. That was my ice breaker for the terrible "buck fever" disease. 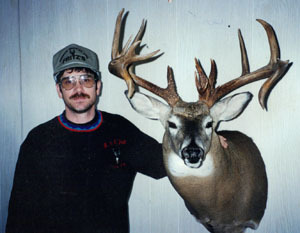 In 1995,I knew I had a chance to take an even larger buck. During my annual first week in August scouting, I was totally amazed at what I was seeing. I saw several nice bucks throughout the area and narrowed things down to four really nice possibilities. I figured one of them might get me in a couple record books. As I was doing my scouting, I tried taking pictures and camcorder shots. The pictures didn't come out very well, but that didn't slow me down. I worked extra hard to get ready for the 1995 archery season. I went to all the 3-D shoots and practiced in my backyard. I fine tuned all my equipment right down to my broad heads and fletchings. I thought it might be to my advantage to try a combination buck and doe decoy. I had several bucks come into the decoy several days before the season so I knew I was on to something. I continued with my scouting and thought I was on the right track to harvesting one of the four nice bucks I scouted earlier. But then the farmer cut his corn just a week before the season. The first three days I sat in my tree stand with the decoys and some dominant buck lure soaked in cotton balls. I saw several bucks. One was really nice but not one of the four that I had my goal set on. But, the decoy was working so well, I knew it would reel in one of the big boys. As I sat in my stand in the evening I could see the bucks 400 yards across the road stand in a freshly cut corn field, that was where they were coming from. It dawned on me that they were pretty much in the corn all the time, but I didn't have permission from the farmer to hunt that field. I called the owner that night and he said he had no problem with me archery hunting the property. On the fourth morning, I set up my decoy anxiously waiting for the morning hunt to end so I could go across the road to do some scouting. There I encountered many nice rubs and pretty big scrapes. A big smile came over my face when, in one of the scrapes, I saw the biggest hoof print I'd ever seen from a deer. I scouted only a few hundred yards further, not wanting to disturb the area more than I already had. I found a nice tree overlooking a small, thick, brush lot with about 25 acres of goldenrod field off in the distance. There was also a smaller, freshly cut, goldenrod field directly in front of me with some hardwoods and thick pines behind that. This is where I set up my spare stand, which I keep just for the occasions when I have to move quickly. I felt confident that I might put my tag on one of those four possibilities that evening. I went home to clean up, figuring to be back in the stand around 3:30 pm. When I returned later I gathered my equipment, pulled my decoy from the back of the truck, deodorized it with scent killer and went about setting up in the corner of the freshly cut goldenrod field. I placed the decoy where it would be near the scrapes and rubs between my stand and a creek bed that ran near the corner of the field. As I climbed into my tree stand and got settled in, I looked off into the larger goldenrod field to see two does trotting across the middle. A few moment later I saw a nice buck trotting towards me about 300-400 yards away. He ducked into the other side of the thick brush lot. A few more minutes went by and I saw a couple does enter the thick brush. Next thing I know, there are ten does standing in the brush lot. Suddenly, I heard a tending grunt. It Spooked me a bit. I looked over my left shoulder towards my decoy then scanned over my right not suspecting what would soon unfold. Just then I saw one of the nice bucks I'd been wanting cross the corner of the goldenrod field. He was about 75 yards out giving me plenty of time to turn around. As I was getting in the right stance for a shot at the first buck, I noticed a smaller buck twenty yards in front of him. The approaching bucks kept tucked along the brush, leaving only two lanes for shooting. The smaller buck moved through the shooting lanes, but I had already decided which but I was going to take. I stood waiting for the bigger buck to make his way into the shooting lane. I remained calm and confident as the buck got only a few yards from the lane. The buck was only six yards away when I pulled back and took aim. The arrow took him through both lungs before sticking in the ground behind him. Instantly, like a race horse the big buck turned and bolted. I watched him go out the same way he came in and with one more bound he was into the goldenrod. I got down from my stand and retrieved my arrow, totally impressed with the color of the blood on it. I knew I had a perfect shot on him. I like to let a wound deer sit for about an hour, but dealing with this buck I decided to wait a couple. That would also give me a chance to call reinforcements to help me with the tracking and dragging of the deer. As we gathered at my house, with total excitement, I was trying to explain to them what had happened. A couple of them were in disbelief. Not that I had shot a nice buck, but rather how nice of a buck it was. when we went to retrieve the buck, I wanted to start at the blood trail, even though I new about were the buck had fallen. We looked, but didn't find any blood. After searching more and only finding pinhead size drops, wwe decided to go straight to where I thought I'd seen the buck fall. Sure enough, there he lay. We were all amazed at how big the buck really was. Closer inspection revealed two beautiful drop tines off each beam. After we finished admiring the monstrous buck, we got down to the business of field dressing him. This is where we figured out why there wasn't much of a blood trail. There was at least 4-5 inches of fat that had plugged the holes, not letting the blood pass out of the chest cavity. I am glad to be able to share my story with other New York hunters. Bill McMind's Schuyler County Buck scored 188-2 B&C as a non-typical and weighed 229 lbs. It is one of the top 5 non-typicals ever taken with a bow in New York.